“Touches of Sweet Harmony” was previously issued on The Acoustic Mandolin Magazine, and posted under the author’s kind permission. All rights reserved. Tune reviewed : “Banish Misfortune” – melody line [Click here for printable notation] – harmony line [click here for printable notation]. A quote from Celtic Sprite: I still recall my first audition of this tune…it was performed by The Chieftains and featured as opening track on their second album in a lovely set along Gillian’s Apples. In past columns I have explained a little about how Celtic music developed through the centuries and how various instruments including the mandolin have been absorbed into the tradition. I want to deal this time with harmonies, but we need to start with a little historical perspective first. There are several parallel Celtic musical traditions, developed for different reasons and on different instruments. For centuries harpers would use their diatonic instruments to play melodies with arpeggiated chordal coloration. But until very recently harpers did not mix with other folk musicians. Their function was more courtly and formal. 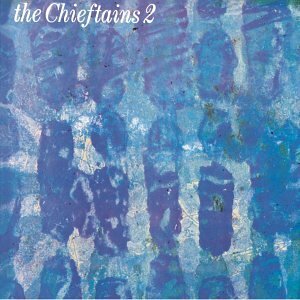 In fact, it wasn’t until our generation that classically-trained traditionalists like Sean O’Riada and Paddy Moloney of the Chieftains began combining Irish harp in ensembles with fiddles, flutes, and pipes and finger-style guitarists turned O’Carolan tunes into standards. Speaking of pipes, there are the two very different worlds of Scottish Highland pipes and Irish uilleann pipes, neither of which mixed much with other instruments beside drums until this century. Again, it was our generation that recognized Highland pipes as one of the great rock and roll instruments ever and bands like the Tannahill Weavers and the Battlefield Band blazed loud and boisterous new directions to take both military and dance tunes in. The quieter uilleann pipes, played by pumping a bellows with one elbow with the drones pointing down to one side and the melodic chanter on the knee, were used both for dance tunes and for haunting set pieces and slow airs. Developed and improved upon during the Industrial Revolution, some uilleann pipes began to feature valve keys called regulators which could change the pitch of the drones and, within strict limits, supply chordal accompaniment to the melody. But like the Highland pipes, uilleann pipes did not play with fiddles and flutes in ensembles as a rule until very recently. Then there are the dance tunes—the jigs and reels and hornpipes written on and for fiddles, flutes, whistles, and free reeds—which most mando players are most drawn to. These, too, have been treated primarily as a straight melody art form if you don’t count the oom-pah accompaniments played by accordions a century ago and then imitated by pianos on through the 20th century right up to the modern folk revival. The old recordings of the great fiddlers of the 20s like Michael Coleman are often hell to listen to today, because of the stultifying and ham-fisted piano accompaniments. But as guitars gained popularity in sessions, new chordal voicings and possibilities got experimented with and it became permissible to break step with all the unison players and toss in some harmony. And now to our general delight, the harmonic fun that Celtic musicians have with even the simplest tunes passes the old masters by leaps and bounds. Mandolins and citterns are among the most versatile instruments in modern Celtic music simply because one minute we can whip out melodies complete with cool ornaments and the next we can drive tunes with chords and rhythmic emphasis. We can also borrow the drone idea from the pipes and create implied chord changes by moving melodic phrases against open strings. We’ll have some fun with that next time. In this notation I’ve included a few triplets, both ascending and descending. As always, you should feel free to play or omit ornaments as you see fit. If you’re looking for good places to try adding other triplets, try “tripletizing” just about any quarter note. All the quarter notes in “Banish Misfortune” hit on a 1 beat or a 4 beat. And since these are the emphatic beats that drive the jig forward, digging in a little extra with a nice same-note triplet ornament is entirely appropriate. Now for the harmony line [click here for printable notation]. This harmony, or one very much like it, is widely popular in the pub sessions. You’ll notice that the harmony is not simply a parallel line above the melody. It crosses the melody and occasionally plays in unison, though the beginnings and endings of each phrase convey a happy harmonic lilt with implied chords. So what might you do with this harmony in a pub session, once you’ve got it under your fingers? My advice is always to start out simple, then make the tune a little more fun each time. I’d play straight unison all the way through once, then perhaps break into the harmony line on just the last three bars of each part the next time through. Then, harmonize all the way through each 8-bar part but not on the repeats. Then, if the band is still up for it, go hogwild and harmonize all the way through. Mixing it up is always fun. And everybody in the session will enjoy a little energy boost. Of course, not all Irish and Scottish tunes lend themselves equally to harmony lines. I find tunes that sound like they were written for Highland pipes among the hardest to do anything with harmonically. “Gravel Walks” from the Fall 2000 issue, for example, is a tune that seems most effective playing against a strong drone tonic. Whenever I try to harmonize horizontally it sounds needlessly busy. But others love a little harmony. “The Pinch of Snuff” cries out for a close harmony. Again, like in “Banish Misfortune,” I’d let the harmony come and go, alternating harmony phrases with unison phrases to keep it interesting. And in “The Coleraine Jig” I like to wait until the B part of the tune and harmonize about the first four bars, just for a dash of sweetness at the most melancholy melodic moment. Try harmonizing some of your favorite jigs and reels. Remember that you don’t have to harmonize all the way through—that even two or three notes in passing can give a tune a lovely splash of color while you make it more your own. Hi to all…enjoy this well known tale regarding the Swan Maidens Motif : “The King of Ireland’s Son and the Enchanted Daughter”. 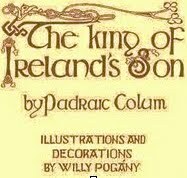 Posted from the book “The King of Ireland’s Son”by Padraic Colum[b. 1881 d. 1972.] with illustrations and decorations by Willy Pogány [b. 1882 d. 1955].New York, H. Holt and Company  . (Obtain this full work and many more backups by clicking here!) They came, they flew down, and when they touched the ground they transformed themselves into three maidens and went to bathe in the lake. The one who carried the green scarf left her swanskin under a bush. The King’s Son took it and hid it in a hollow tree. Two of the maidens soon came out of the water, put on their swanskins and flew away as swans. The younger maiden stayed for a while in the lake. Then she came out and began to search for her swanskin. She searched and searched, and at last the King’s Son heard her say, “I would do anything in the world for the creature who would find my swanskin for me.” Then he came from where he was hiding and gave her the swanskin. “I am the Son of the King of Ireland,” he said, “and I want you to show me the way to your father’s dominion.” “I would prefer to do anything else for you,” said the maiden. “I do not want anything else,” said the King of Ireland’s Son. “If I show you how to get there will you be content?” “I shall be content.” “You must never let my father know that I showed you the way. And he must not know when you come that you are the King of Ireland’s Son.” “I will not tell him you showed me the way and I will not let him know who I am.” Now that she had the swanskin she was able to transform herself. She whistled and a blue falcon came down and perched on a tree. “That falcon is my own bird,” said she. “Follow where it flies and you will come to my father’s house. And now good-by to you. You will be in danger, but I will try to help you. Fedelma is my name.” She rose up as a swan and flew away. This is one of my beloved poems from the Scottish musician Robin Williamson, it belongs to the track of the same name issued on the double album “U” while being member of the Incredible String Band in 1970. The poem recited by Robin, was recorded with an ambient musical background that reflects indeed a sheer invocation to Faeirie dwellers. Galicia and Asturias: Celtic Nations with Celtic Heritage! Being a Galician descendant it’s very annoying for me to accept that the Celtic League and the Celtic Congress conceive the possession of a Celtic Language as ‘the principal’ element of our Celtic Nationality, subscribing to the present concept of “nation” used in this context to mean a group of people associated with a particular territory who share a common identity, language or culture, and is not synonymous with “country” or “state“; in brief the most common criterion for Celticity, that of having a Celtic language. Due to this resolution Galicia and Asturias aren’t among the six nations conside red as the heartland of the modern Celts, even though their archeological, historical, and ethnic celtic past prove the contrary. I had always conceived language as a vehicle, the means for retelling lore from one generation to another. One of the sheer methods for people’s identification, but is it language so important as to enable ourselves to detect a Celtic heritage?. Hadn’t people such as Irish been obliged to study English to emigrate and be employed by English patrons?. Didn’t Welsh people suffer the Welsh Not English penal laws even at school?. I agree that English is adopted today as an international means of communication between bilingual cultures, in fact it is through English Language that I am now having contact with you and this doesn’t make worthless our celtic experiences. And if we play the role of purists, should we label those so called “Celtic Bands” less folk or less Celtic for their employment of lyrics in English . It shall do no good for us to speak Celt not knowing ourselves as thoroughly celts. Galicians preserve a lot of Celtic words in the Galician Language such as: Adobiar (‘to mend’), Berro ( ‘scream’)-,Bico (‘kiss’), Callau (‘peble’), Camiño (‘road’) –Rego (‘track’) –Virar ( ‘turn back’), etc. Even Pre-celtic words such as: Moroa (‘dark hair, hip ‘)- Bousa (‘moimd’) carballo (‘oak’) –pala (‘cave’) ,etc. In fact our aims should go further, let us talk about it. The tight polemic at the Celtic League 1987 A.G.M. recalls me the same one raised upon the definitions of ‘Nation’ stated by Giuseppe Mazzini, his concept of Nation associated to the ethnic and historic relations, which stand out a nation as people amongst others, as Mazzini wished. But its also necessary for that people to crown their image with the knowledge of identity and the wish to play it’s role. We should stress here our objectives add ideals, subjective, creative, and voluntary elements. As a comment to the above, the Celtic heritage of Galicia’ s history, and of her folklore, are plainly revealed, though they don’t make way to alter her present linguistic status into a celtic-speaking nation. Since that…, what argument can we bring up to justify our unusual idealism?. We dont neglect the weight of numbers, but once consummated, english, french, or romanic pressure, the results are parallel. We cannot leave aside to wonder why Galician transculturalization (which continued till 11th Century AC with the help of britonic inmigration slightly expanded up to Galician northern coast), must be essentially considered so different from cornish, which extends till the end of XVIIIth Century. Certainly it’s true that cornish remembrance still lasts, some engraved monuments still existent, in brief, the struggle anyhow continues, no one is dead while he fights, even though Cornish is oftenly considered a dead language. 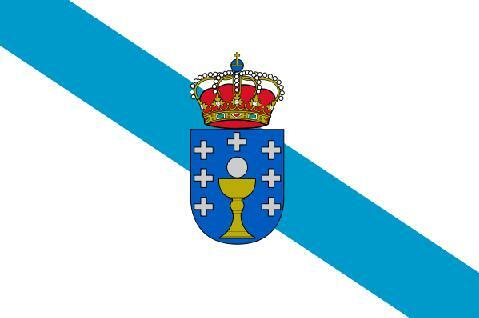 Yes, that ‘ s true; but it’s also true that we Galicians, withstand against cornish will and remembrance, with our own. Maybe we will be called crazy at first, but presently we’re many, all thinking that the Utopia is pregnant by the future. Williamson faced an active career during the last decade. Besides participating in the brief reunion of the Incredible String Band original trio (2000-2002), Robin recorded a remarkable number of albums on his “Pig’s Whisker” label and also joined the ECM catalogue, a hallmark for jazz and experimental music, renowned for generating a special atmosphere in their recordings, which are always performed live in the studio with minimal instruments and overdubs, in order to express the artist in his most natural and naked way as possible. “The Iron Stone” is the third album for ECM Records, as in his previous two, “The Seed-at-Zero” (2000) and “Skirting the River Road” (2002), the repertoire for this album is a combination of his own works along some musical scores for poems from poets of the great Anglo-Saxon literature. However, the extent of their sources, the wealth of sensations and areas that recreate the fifteen subjects, The Iron Stone is far from being another album on Williamson’s discography, but it shows a peak of artistic sensibility. In conjunction with that spirit of spontaneity, The Iron Stone was recorded entirely based on first takes, with the help of Mat Maneri on violin and Viola, the bassist Barre Phillips and Swedish Ale Möller in a variety of instruments including mandola, accordion, clarinet, Jewish harp and various types of flutes. The Iron Stone begins with “The Climber,” an esoteric story about the last will of a climber, urging their three children to climb the clouds, nothing less. Two of them die in the attempt but the third gets the goal, using a rope made of light from the moon. The metaphor of Williamson |is accurate for establishing the central motif of The Iron Stone: the eternal search for meaning for our earthly days and our compulsion to reach the heights in pursuit of that elusive dream. In turn, “Sir Patrick Spens” – a traditional story of sailors who stirred the ghost of predestination: Despite warnings, the king of Scotland insists on sailing in the middle of winter raging sea to complete the commitment of carrying the Norway’s king daughter back to her land. The gloomy atmosphere of the stanzas anticipate the predictable disaster: the ship sinks and along with it will also pique the real arrogance. Williamson agrees with our view that the central theme of The Iron Stone is the human condition and the passage of time. 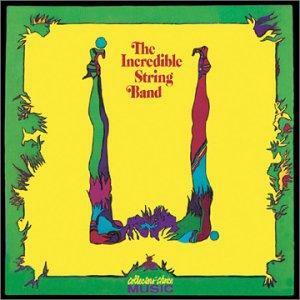 “Life does not last forever,” says former Incredible String Band. But in addition to the selected poems, Robin brings a handful of ideas, among which are “To God in God’s absence” (God, in the absence of God) and “Political lies”, a topic was originally Robin composed for his album Ten of Songs, 1989. There is a Nuance existentialist in its stanzas, which include without bitterness but with a touch of irony, the passing of the years and the tripping of the Politicians that govern nowadays. In recent times there was a Folk Revival in the British Isles. What does Robin Williamson thinks of the legacy of his old group, The Incredible String Band and their influence on emerging artists? — A Quote from Celtic Sprite: “The Iron Stone” is also the title of a song penned by Robin Williamson and featured in the double album “Wee Tam & The Big Huge”, hereby it’s first stanza, that in fact reflects the spirit of the above commented Iron Stone album. Commonly these enchanted maidens are the daughters of a royal magician. Legendary heroes are featured spying them bathing or dancing, and marvelled by their beauty, they steal their feather cloak. A Swan is the most usual form of the maidens to assume but they’re often doves or partridges. In the main type of the Swan Maiden tale, the hero is set tasks by the Magician or rather Wizard’s father and helped by his future wife. He always follows the same patterns, with the obstacle flight, the destruction of the Wiz and the breach of Taboo qhich causes magical forgetfulness resolved by the motif of the bartered bed. – Hereby a link to the well known legend is the one of “The King of Ireland’s Son and the Enchanted Daughter”. A variant from the Swan Maiden type is the Seal Maiden, more simple with the stealing of the skin and the discovering of the lady’s hollow back. 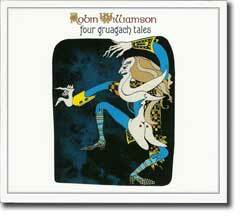 A very nice storytelling regarding Swan Maidens has been recorded by Robin Williamson, on his Four Gruagach CD album, resembling the classi cal ways of retelling and structure with additions that make the whole stories more interesting and exciting including Celtic subjects and mythology. This version of the story of “Prince Dougie”, recalls me of two folk motifs. The legend of “Nicht Nough Nothing” appears in the motif :”There once lived a king and queen. They were long married, and had no bairns; but strangely, the queen had a bairn, when the king was away in far countries.” up to here some basic coincidences. The other is referred to “Green Sleeves”. The hero, son of Scot’s King, who finally arrives to tho river ‘Ugie’ to intercept the three daughters of Green Sleeves who would come to bathe as swans. We may think of certain character parallel between Dougie and Ugie. To purchase a copy click here. Hi to all…enjoy this well known tale regarding the Swan Maidens Motif : “The King of Ireland’s Son and the Enchanted Daughter”. 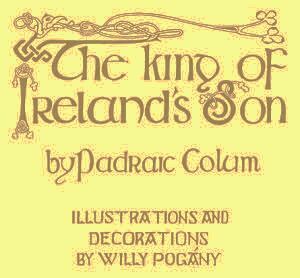 Posted from the book “The King of Ireland’s Son”by Padraic Colum[b. 1881 d. 1972.] with illustrations and decorations by Willy Pogány [b. 1882 d. 1955].New York, H. Holt and Company  . They came, they flew down, and when they touched the ground they transformed themselves into three maidens and went to bathe in the lake. The one who carried the green scarf left her swanskin under a bush. The King’s Son took it and hid it in a hollow tree. “I would prefer to do anything else for you,” said the maiden. “I do not want anything else,” said the King of Ireland’s Son. Now that she had the swanskin she was able to transform herself. She whistled and a blue falcon came down and perched on a tree. “That falcon is my own bird,” said she. “Follow where it flies and you will come to my father’s house. And now good-by to you. You will be in danger, but I will try to help you. Fedelma is my name.” She rose up as a swan and flew away. “I am willing,” said the King of Ireland’s Son. “I suppose you can do without sleep too?” said the Enchanter of the Black Back-Lands. “Easily,” said the King of Ireland’s Son. The King of Ireland’s Son went into the little tank. He was uncomfortable there you may be sure. But in the middle of the night Fedelma came and brought him into a fine room where he ate and then slept until the sun was about to rise in the morning. She called him and he went outside and laid himself down in the water-tank. As soon as the sun rose the Enchanter of the Black Back-Lands came out of the house and stood beside the water-tank. “Come now,” said he, “and I will show you the first task you have to perform.” He took him to where a herd of goats was grazing. Away from the goats was a fawn with white feet and little bright horns. The fawn saw them, bounded into the air, and raced away to the wood as quickly as any arrow that a man ever shot from a bow. “That is Whitefoot the Fawn,” said the Enchanter of the Black Back-Lands. “She grazes with my goats but none of my gillies can bring her into my goat-house. Here is your first task–run down Whitefoot the Fawn and bring her with my goats into the goat-shelter this evening.” When he said that the Enchanter of the Black Back-Lands went away laughing to himself. He thanked Fedelma. He put on the Shoes of Swiftness and went into the wood. Now he could go as the eagle flies. He found Whitefoot the Fawn drinking at the Raven’s pool. When she saw him she went from thicket to thicket. The Shoes of Swiftness were hardly any use to him in these shut-in places. At last he beat her from the last thicket. It was the hour of noon-tide then. There was a clear plain before them and with the Shoes of Swiftness he ran her down. There were tears in the Fawn’s eyes and he knew she was troubled with the dread of losing her silver horns. He kept his hands on the horns and they went back over miles of plain and pasture, bog and wood. The hours were going quicker than they were going. When ‘he came within the domain of the Enchanter of the Black Back-Lands he saw the goats going quickly before him. They were hurrying from their pastures to the goat-shelter, one stopping, maybe, to bite the top of a hedge and another giving this one a blow with her horns to hurry her on. “By your silver horns, we must go faster,” said the King of Ireland’s Son to the Fawn. They went more quickly then. The King of Ireland’s Son went back and into the dry water-tank. He was tired with his day’s journey after Whitefoot the Fawn. It was his hope that Fedelma would come to him and give him shelter for that night.